Harris Bros & Collard Ltd were appointed in August 2015 to carry out remodelling works within Willow Ward mental health unit in Bridgwater. Careful consideration was required for the delivery of this project, with extremely limited access due to the rest of the Ward remaining in full operation throughout the works. Access to the site was through 6 security locked doors and access was therefore only permitted by the Site Manager. 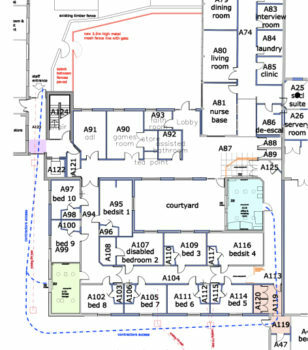 The works included a full strip out of the existing office and bedrooms, with remodelling works carried out to create a new en-suite bedroom, Nurses Office and new external courtyard garden. The courtyard garden included erection of 3m high metal security fencing. All works were completed on time and to budget, with these rooms being handed back over to the client for occupation in late 2015.